Ana has been through the foster care system in Los Angeles, getting kicked out of one home after another for being a "problem" or "not what they were expecting." As a last effort, she has accepted a position as a farmhand over the summer at a farm in northern California. If things go well, she might be able to stay through the first semester of the school year. She just has to make sure she doesn't screw it all up again; trouble seems to follow her like a curse. Abbie and Emmett Garber, a brother-sister duo, are struggling to keep their farm up and running as work increases as well as costs. Abbie has the idea to become a temporary guardian to a foster child in exchange for having her help around the farm. Emmett reluctantly agrees, expecting a boy, but is surprised to discover a girl by the name of Cortez waiting for him at the airport. Can Ana overcome her self-doubt and Emmett's reluctance, as well as prove herself, to finally find a place where she belongs? I love this book. So much. I was excited to hear about it in the first place: a retelling of Anne of Green Gables set on a farm in northern California? Sign me up. 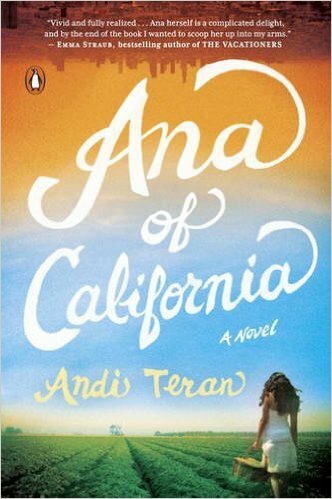 Ana of California exceeded my expectations and has earned a permanent spot on my bookshelf. Andi Teran did an excellent job of bringing the original story into present day. Ana, a gifted artist, is so sweet and caring, and has a poetic way with words as the original Anne does. There are all these little details throughout the book that are a nod to the source material, incidents (like the hair dye disaster) that are retold, and characters reimagined. Really, I loved every single scene in this book, just like I loved every single scene in Anne of Green Gables. If you have any fondness at all for Anne Shirley, you'll love reading about Ana Cortez. Please do yourself a favor and go out and get this book right now. Library, bookstore, friend who owns it, whatever. You'll be happy you did. Disclosure: I won a copy of this book through another blogger, Cassi Steenblok at My Thoughts Literally, who hosted a giveaway through Penguin. Thanks Cassi, I loved it! Great! I would like to read it. I love the cover and the synopsis. Thank you for your review. I started this one a while ago, but never go into it. Then again, I don't think I've ever read Anne of Green Gables, so maybe it's better if you've read the "source" material? Your review makes me want to give it another try though.